Kuranda Envirocare has a nursery to provide local provenance or native trees for our revegetation projects and for the local community. Using seed from local native trees will ensure we are not introducing variations that would not occur naturally. Even plants from the same species show genetic variation across an area, hence the need to source seed and seedlings locally. 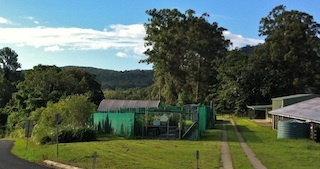 The nursery operates completely on volunteer labour. We collect seed, apply appropriate treatment, sow seed and pot out seedlings when they are ready. When the seedlings are large enough, our revegetation team plants them in the field during our regular Saturday morning working bees. No experience is necessary to volunteer for nursery or planting days. 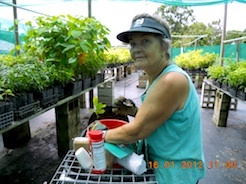 More experienced nursery volunteers will train you on the job. We also have an educational DVD on techniques on growing and planting natives. 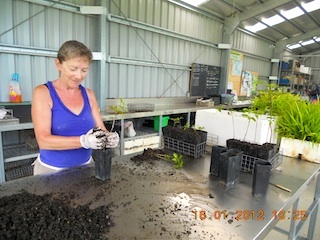 Mondays and Thursdays are our nursery volunteer days (9am to 1pm). The nursery is also open for sales on these days as well as Saturday mornings (10am to 12pm). A number of the plants we propagate are suitable for residential blocks, especially for attracting butterflies and birds. We will exchange plants for seeds, for your time as a volunteer in the nursery, or for your time on revegetation or other Envirocare “work”. We also accept monitory donations to cover the costs of propagating the plants.